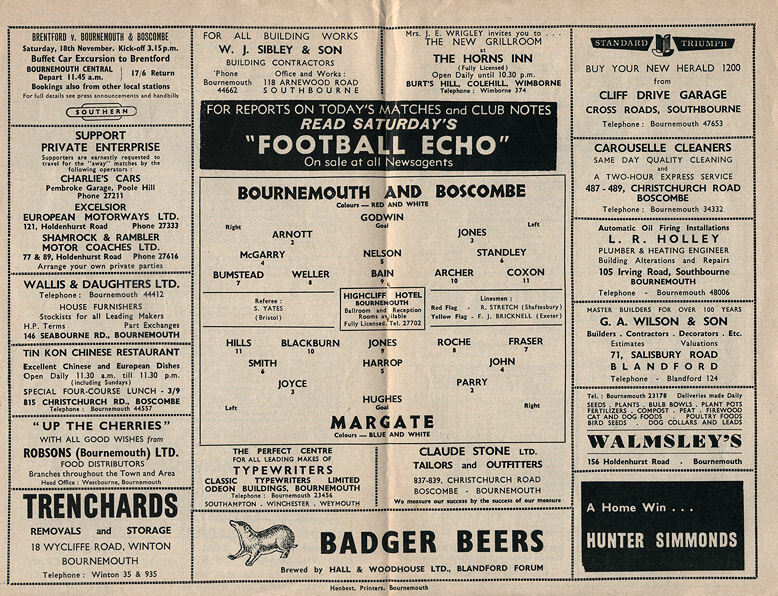 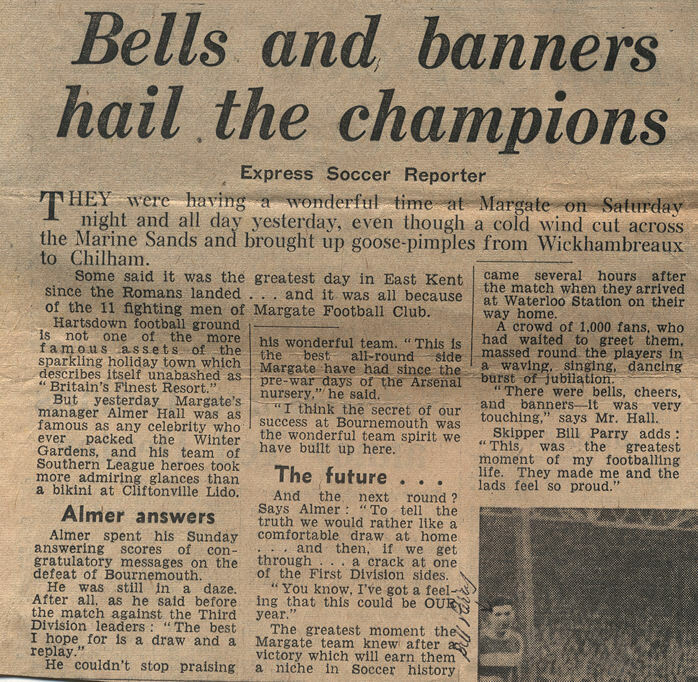 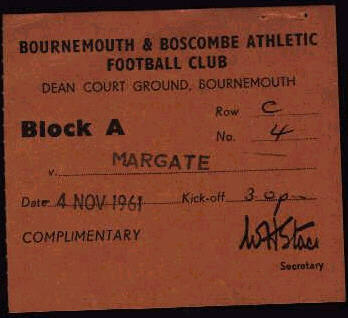 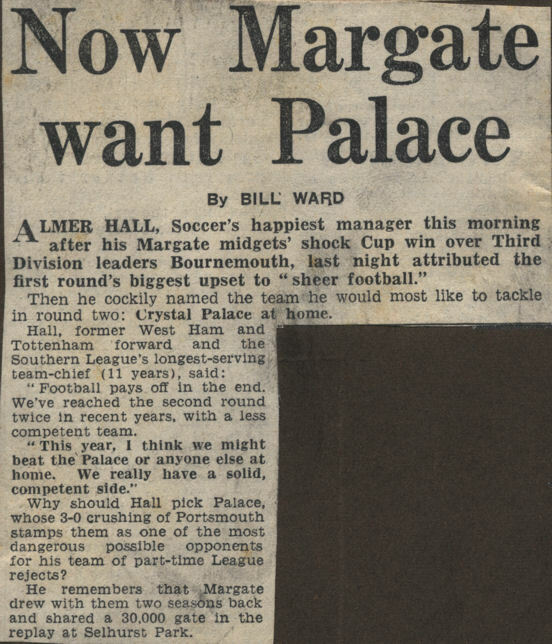 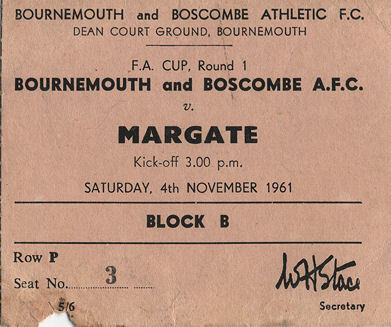 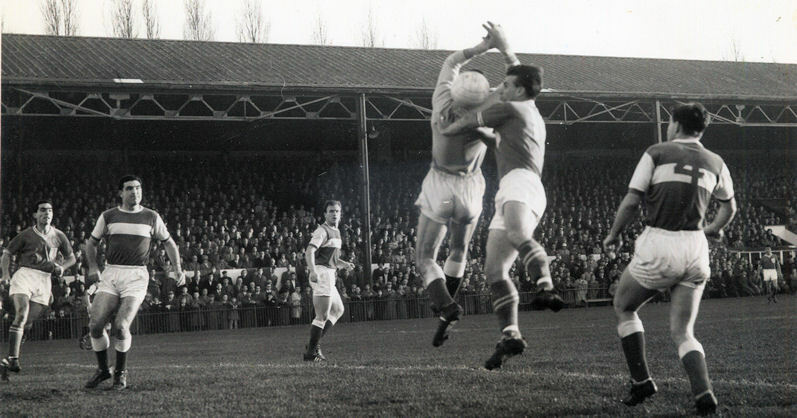 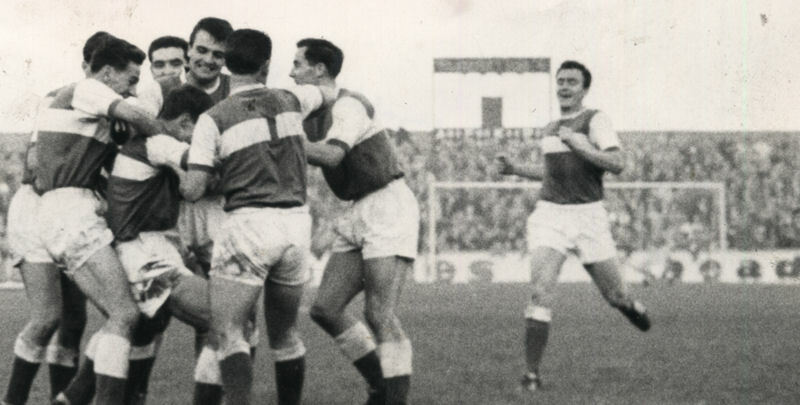 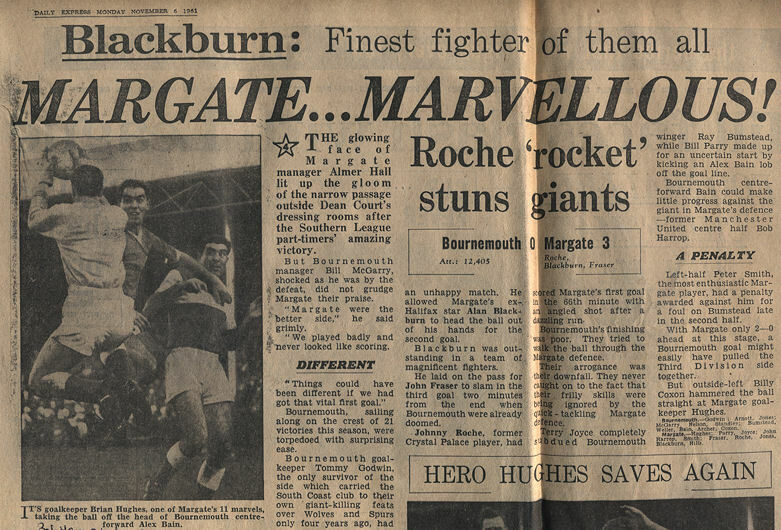 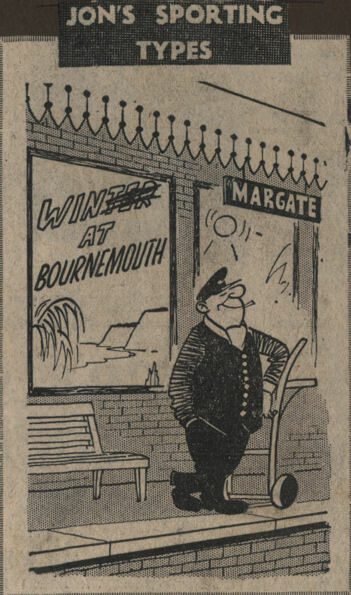 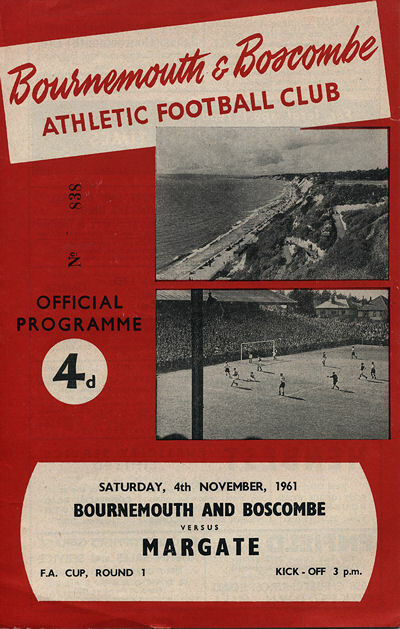 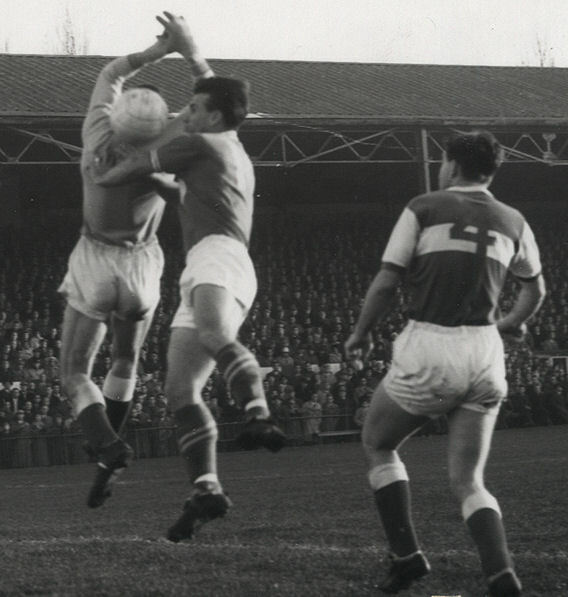 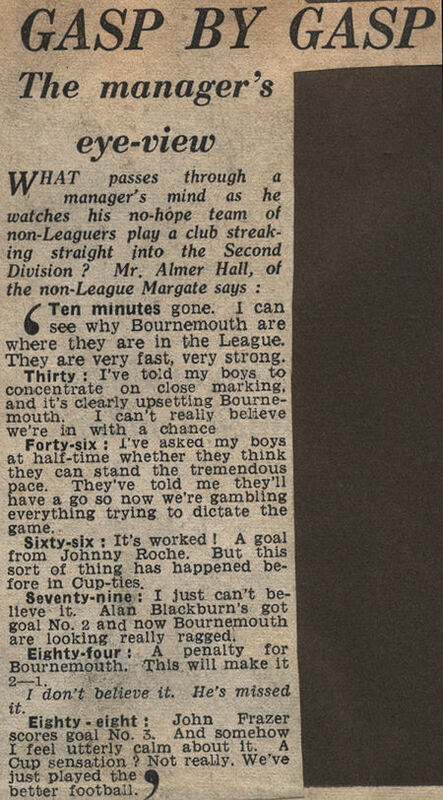 A famous win for Margate, Bournemouth were top of Division Three and unbeaten at home. 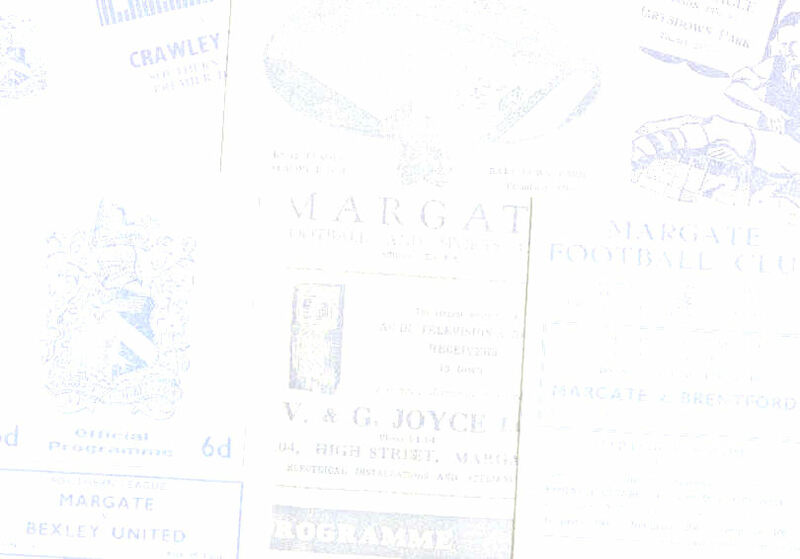 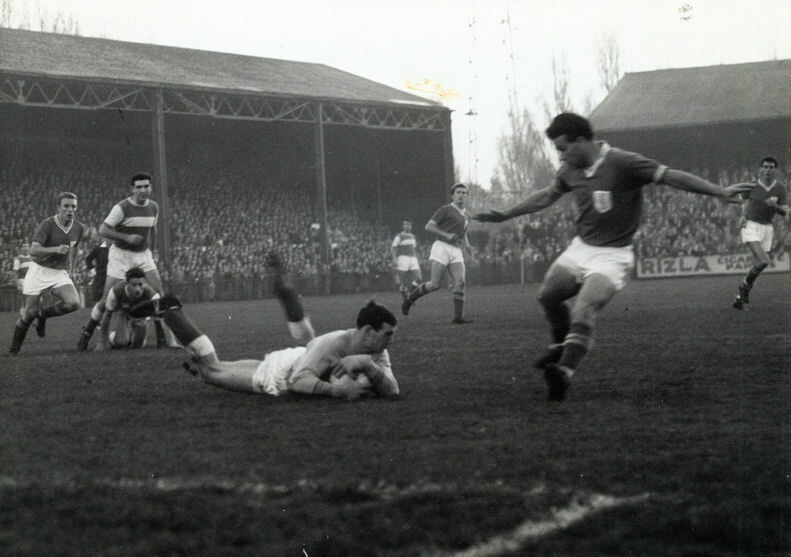 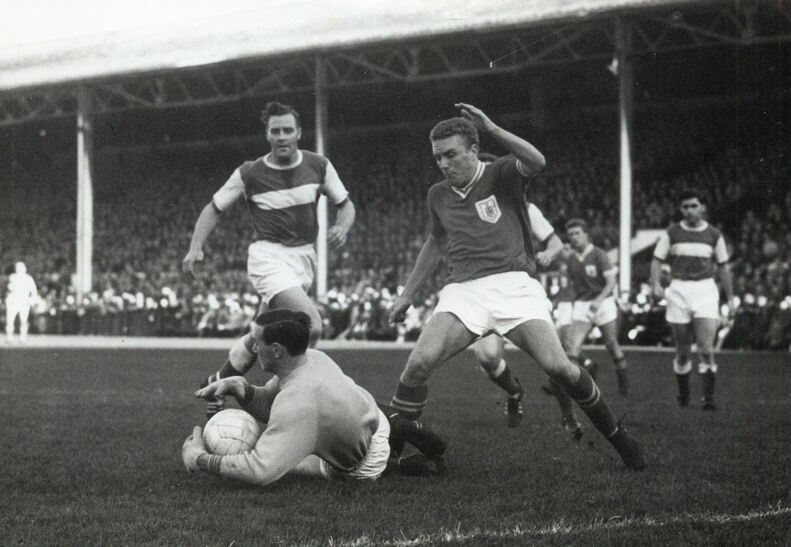 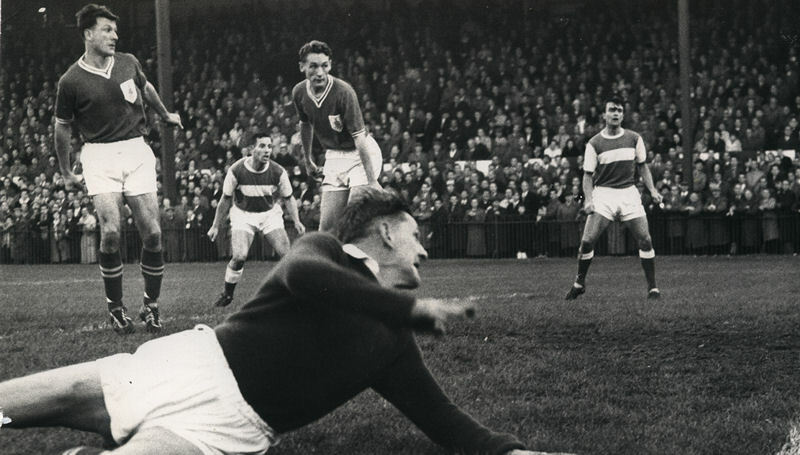 At half time it was 0-0 but after 66 minutes Johnny Roche put Margate ahead and further goals from Alan Blackburn and John Fraser sealed a memorable victory whilst Brian Hughes saved a penalty with the score at 2-0. 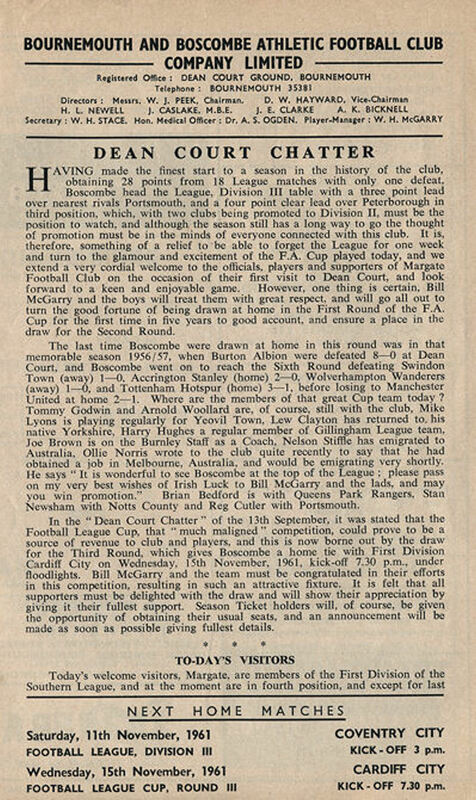 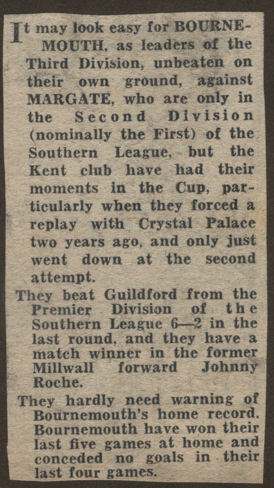 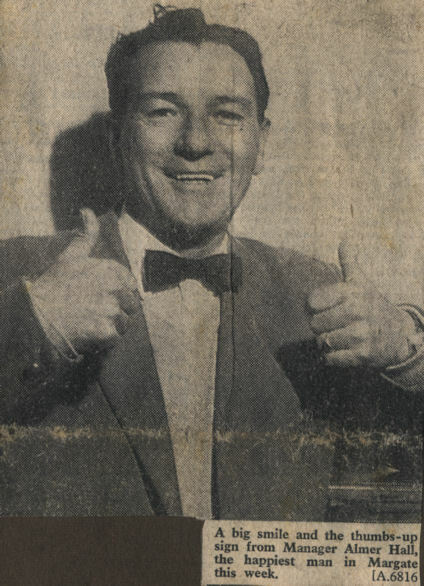 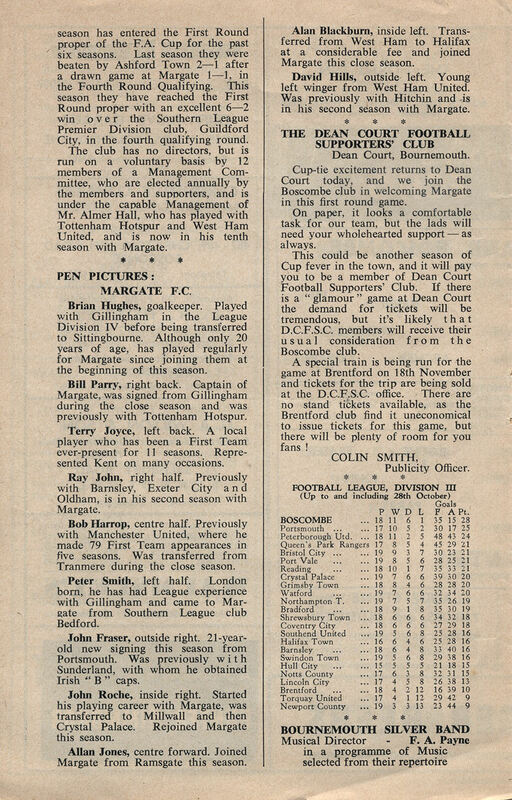 To celebrate the win Margate's management committee presented all the players with cigarettes whilst Johnny Roche won an engraved cigarette lighter from the Sporting Record newspaper who rated his performance as the best of the week. 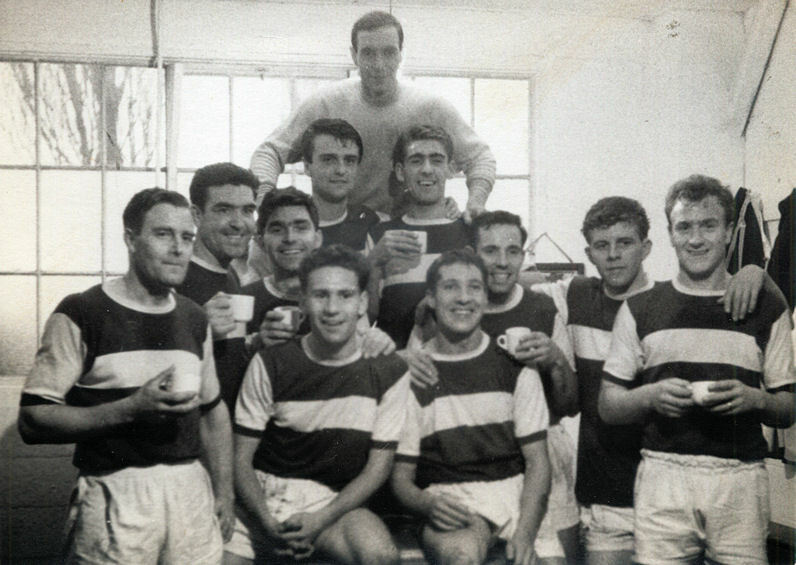 This photo is the closest one to Margate's team on the day but includes Tommy Barnett who didn't play and excludes Ray John who did. 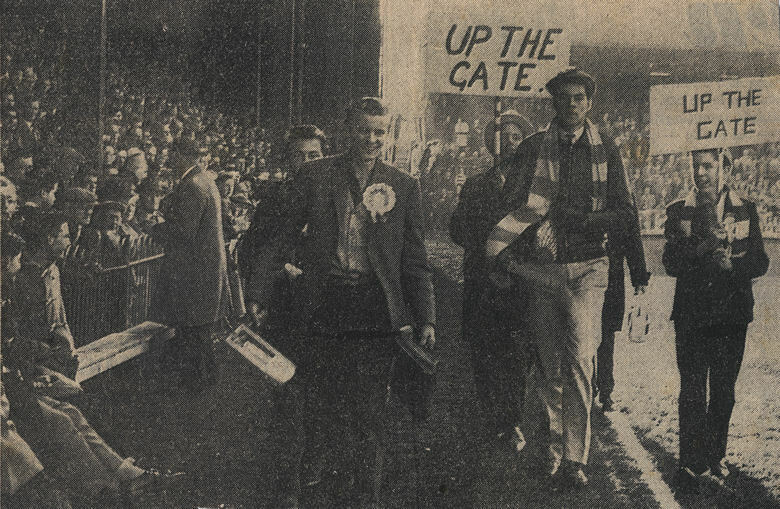 KICK-OFF APPROACHES Margate fans parade around the pitch before the start of the match. 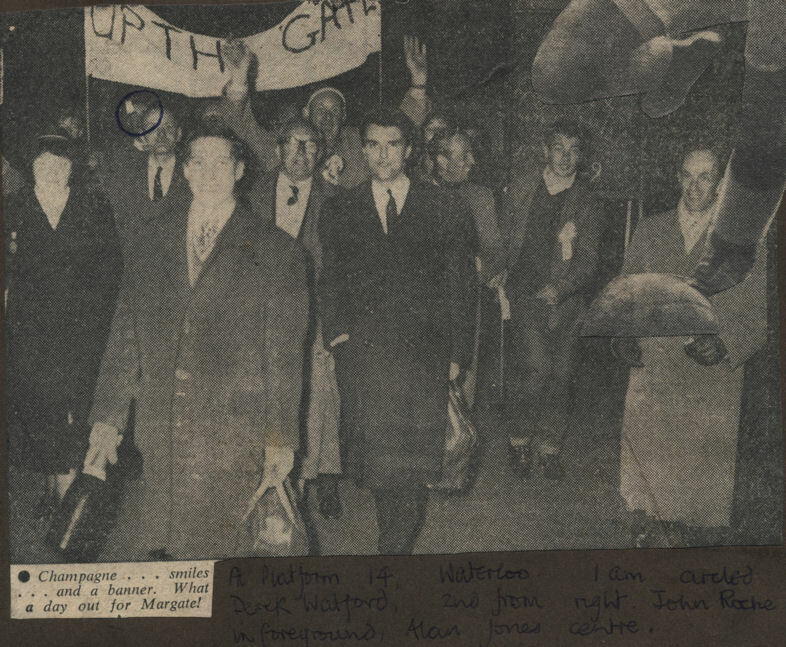 A scrapbook I have suggests the people in the photo directly below are (left to right) Tim Woods, Peter Beard (with rattle), 'Dibs' or 'Dibo' (with the large sign in all three pictures), Trevor Berry and 'Trevor' (with the small sign). 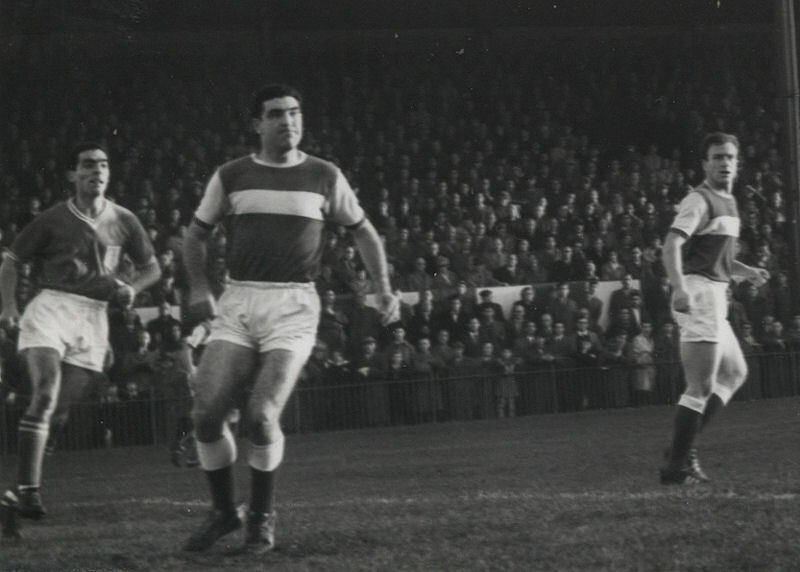 Back: Brian Hughes with Alan Jones (left) and John Fraser (right) in front of him. 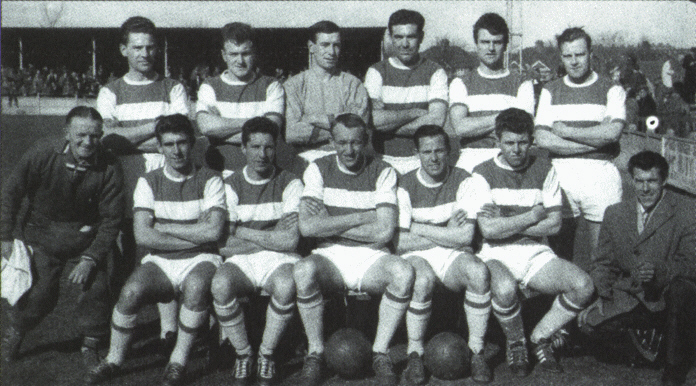 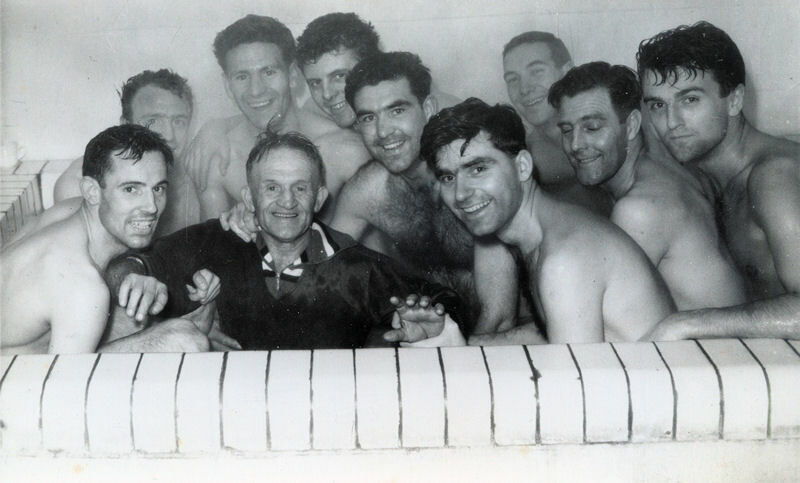 Middle / Front: Terry Joyce, Bob Harrop, Ray John, Bill Parry (at front clasping hands), Johnny Roche, Alan Blackburn (with arm over Roche's shoulder), David Hills and Peter Smith. 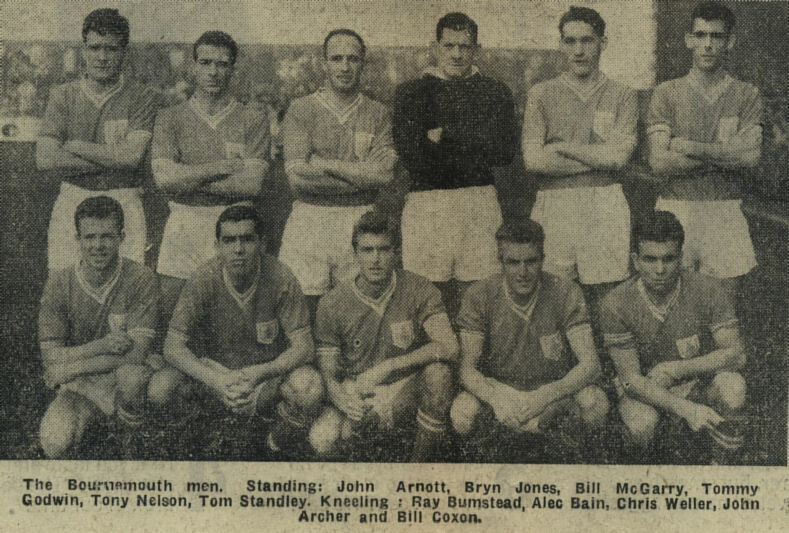 Back: Peter Smith, Bill Parry, David Hills, Bob Harrop, Brian Hughes, Terry Joyce and Alan Jones. 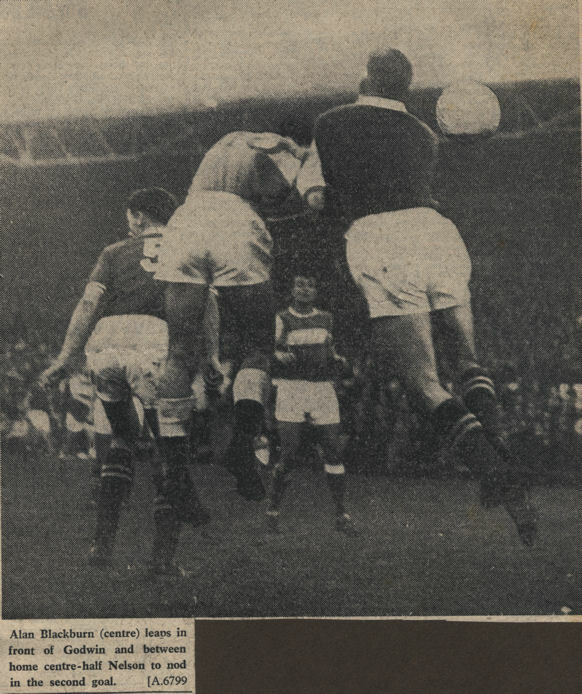 Front: Alan Blackburn, Bob Wainwright and Ray John. 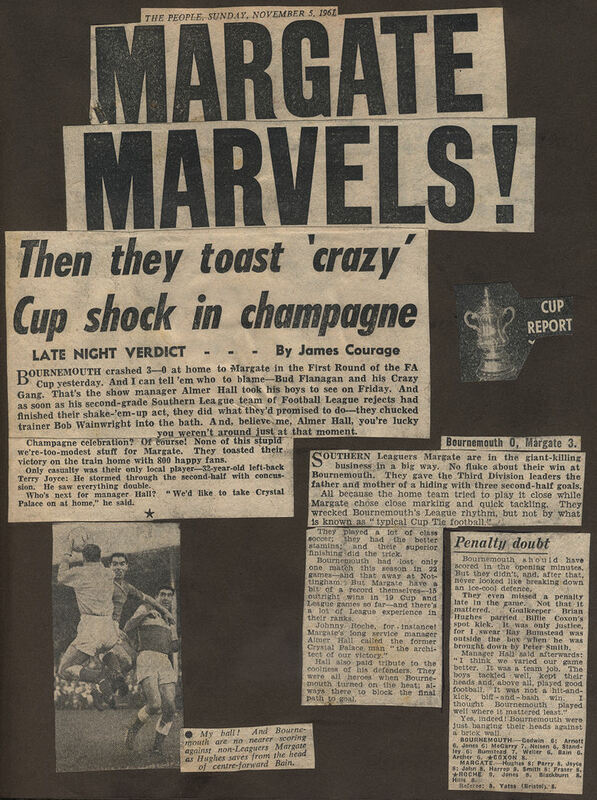 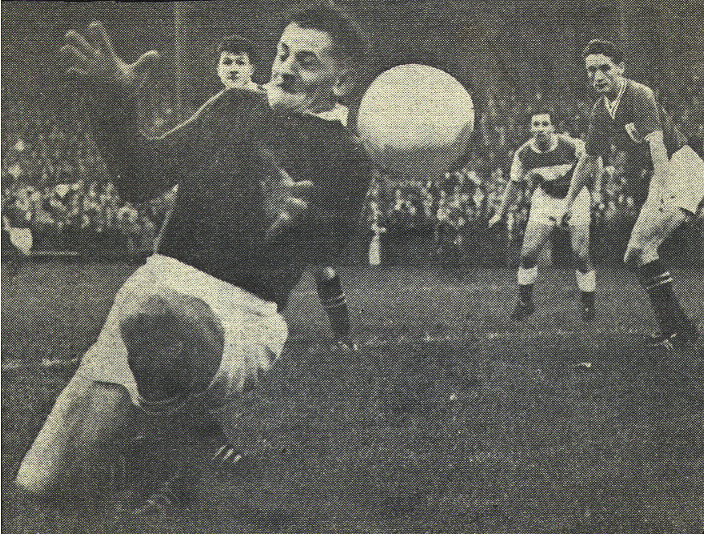 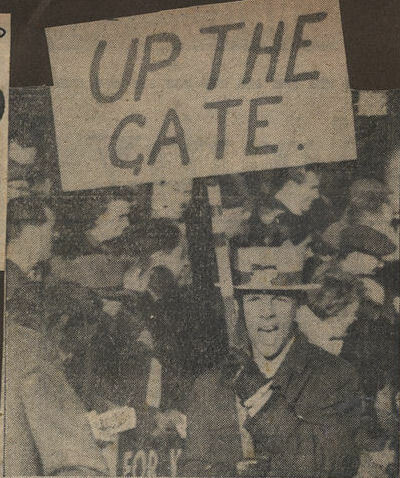 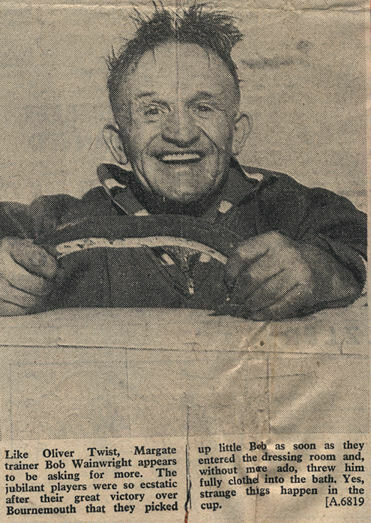 As per the hand-written caption the person circled is Trevor Berry, another one of the supporters is Derek Watford and the two players in the foreground are Johnny Roche (clutching a bottle of champagne) and Alan Jones. 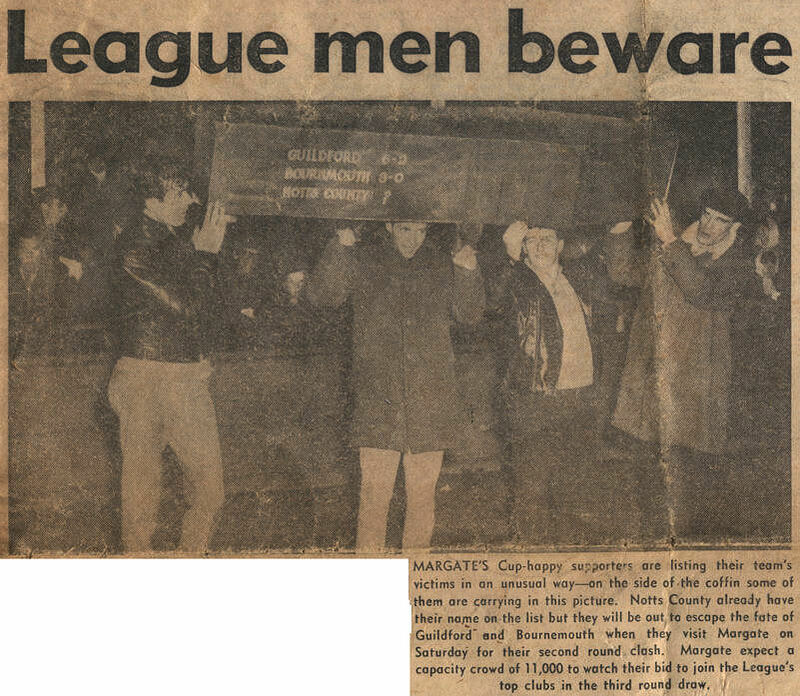 ...the photo above was in the Evening Standard and was kindly lent to me by Harvey Lockwood who's the person on the left holding the coffin. 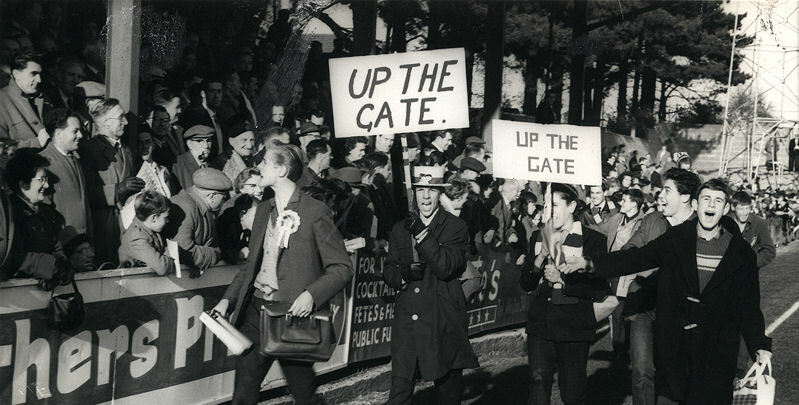 The other three bearers are (from the left) Robin King, Tony Ball and Keith Ford. 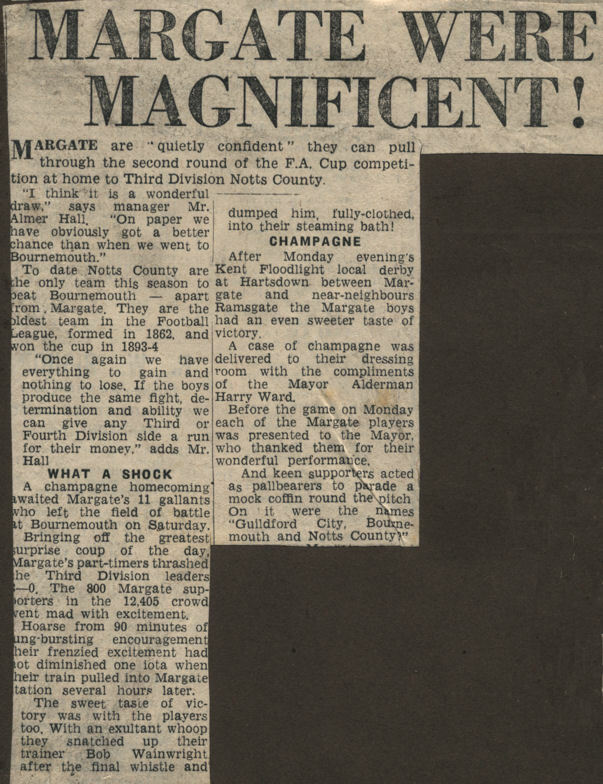 In 2011 Harvey recalled "The coffin was made at the Thanet Press, and with all those printers around, we managed to spell Bournemouth incorrectly !"